Hurriyat Conference (G) leaders and activists staged a protest demonstration after congregational Friday prayers at Hyderpora here against the human rights violations, excessive use of pellet guns and shifting of political prisoners outside the state. Hurriyat Conference (G) leaders and activists staged a protest demonstration after congregational Friday prayers at Hyderpora. In a statement Hurriyat (G) said that it organized a peaceful protest at Hyderpora Srinagar against “state-terrorism” and besides large number of people and leaders including Molvi Bashir Ahmad Irfani, Bilal Ahmad Siddiqui, Syed Bashir Ahmad Indrabi, Mohammad Yousuf Naqash, Khawaja Firdous Wani, Mohammad Yaseen Aatie, Mohammad Maqbool Maghami, Arshad Aziz, Syed Imtiyaz Haider, Imtiyaz Ahmad Shah, Syed Mohammad Shafi, Mubashir Ahmad Bhat, Zahoor Ahmad Beigh and Ashiq Hussain Sofi and other participated. “Delhi try to test their muscles and arsenal on the peaceful protestors who are just demanding their basic and fundamental right, right to self-determination as promised by their own leaders,” said Hurriyat (G) leaders in a statement. “Voicing serious concern over the shifting the prisoners outside the valley, leaders demanded immediate halt on such arbitrary measures perpetrated by Indian administration, they appealed world human rights organization for their cognizance and impressed to raise their voice and come to the rescue of subjugated people in Kashmir,” they in a statement said. “Under well thought out plane the authorities and their forces are carrying genocide,” they said. Hurriyat leaders while condemning the prolonged detention of political prisoners and called it an extreme “vandalism” and coercion, which presents a martial law like situation. Demanding immediate release of all political prisoners including leaders lodged outside the state, Hurriyat leaders said that by pushing people to wall Delhi will achieve nothing, they should face the political leaders and workers on political turf. 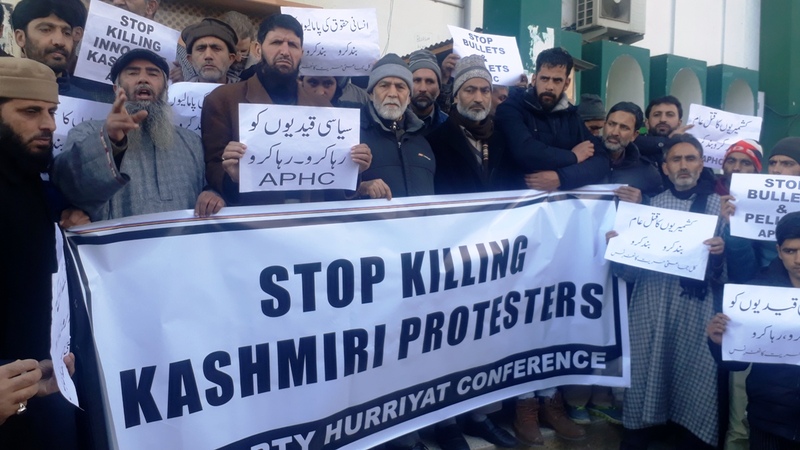 The protesters appealed to the Amnesty International, Asia Watch, and other international organizations for human rights to take cognizance of the plight of people of Kashmir and urged them to fulfil their obligations in accordance with human rights specified for the world community. Meanwhile, Hurriyat Conference (G) chairman, Syed Ali Geelani has condoled the demise of mother of Chief Editor of Daily Reader Haji Hayat and elder brother of prominent columnist and renowned charted accountant Abdul Majeed Zargar. Hurriyat chairman said that we share the grief with bereaved family and pray for eternal peace of deceased and courage for the family to bear this painful loss.